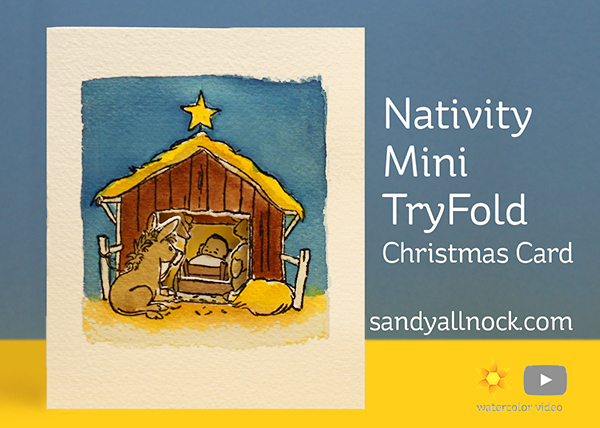 I’ve been making a bunch of these Mini TryFold Nativity cards for my Christmas stash…they’re beautiful and simple, very flat – and easy to color quickly! I stamped a bunch using the MISTI – once I had it set up I just kept stamping! 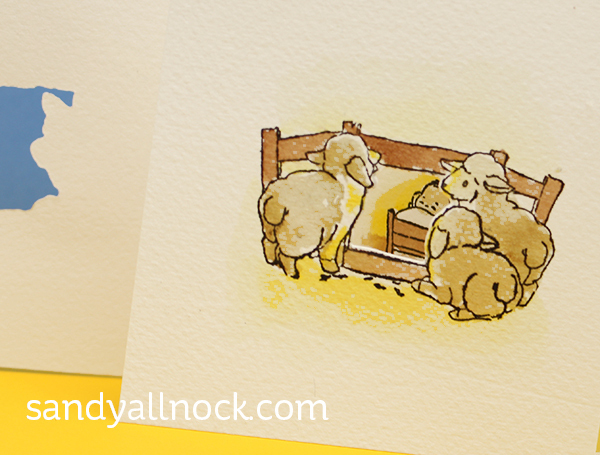 Included in the video is an idea for making it easy – using just the droppers and not a palette. Watch the video below or click HERE to see it in HD on YouTube. I love the Hydrus watercolors for their intensity – and that they don’t “move” once you go over them with another color. But they also blend with other colors while wet, too. Best of both worlds! The three sets of 12 have different groups of colors – see which ones would work most with the kinds of images you color most. I love this card! It is my one that you have done since I have been watching you. It is so beautiful! Thank you for showing it! Beautiful, and you always make it look so easy. Thanks. Oh Sandy that is such a sweet card. Those Hydrus watercolours look interesting to use. Very nice job! I have become a ‘legal stalker’ of all your videos. Your style seems so simple and yet you get such wonderful results. I appreciation all your tips and although I am not a watercolourist (yet) I am absorbing all your shared knowledge and who knows, one day I may paint something that looks identifiable. 🙂 Thanks for sharing your skills with us. I think you have a magic paintbrush! Glad to see the pin… Love your work, as always, though it doesn’t look like “work:”..more like pure joy! It’s actually Try. That’s what Art Impressions calls it. 🙂 And no reason really, I just love yellow. Please accept my apology; I should never have doubted you. So beautiful. Your artistry shows through everything you do. I think that is why I can never achieve what you do with colors. So envious! Gorgeous as usual. Love your pin even more.